Check the New Mid April Bulletin including Resources on Metals, Part 2. This new issue (the 153th) of Practical Welding Letter calls readers' attention to a few technological developments reported in the press, that point to advancements likely to have increasing importance in the near future. While the consequence of Additive Manufacturing is gaining further recognition as a fundamental change in the economy of parts making, the time feels ripe for the conquest of ever enlarging boundaries, as proved by experimental production of items of respectable dimensions. A report on this subject (2) shows what has been achieved by using arc welding, and what improvements on existing software must still be achieved to open the way to massive robotic production. Hand grinding must almost always precede or follow welding in many fabrication jobs. Two reported articles (3) were recently published discussing equipment parameters and tips on selection and correct performing of cost efficient work. When large fabrication projects require lots of welding, it may pay to study (4), by collecting data if, by substituting a kind of filler metal with a different one and changing accordingly the working parameters, one could achieve substantial savings of time and cost. The reported story might induce those working on similar jobs to examine if a similar switch is likely to help them achieve potential benefits. Mechanical testing laboratories work for decades with reliable equipment. However as the materials to test change and improve, also testing equipment has to be updated along the lines introduced by a reported overview (7). The Page of this Month (8) reports on the new Mid Month Bulletin with Resources on Metals Part 2, following the project to build a Materials Encyclopedia Online to enrich quite economically the knowledge base required for study and for reference. Readers who may feel the need to be informed are urged to join the effort and build for themselves at no cost a valuable professional bookshelf. The plasma spray equipment improvement reported (11) is quite specific and refers to a number of parts of military aircraft engines that may not be of interest to a lot of readers. Nevertheless it may be worth checking if the time reduction benefit in applying plasma spray could be obtained also for other more mundane jobs. The other columns appear at their usual place. Enjoy reading on. We would like to hear if you can find, as we hope, anything useful or at least interesting in every issue of this publication. Let us know by sending your feedback, using the Contact Us Form. 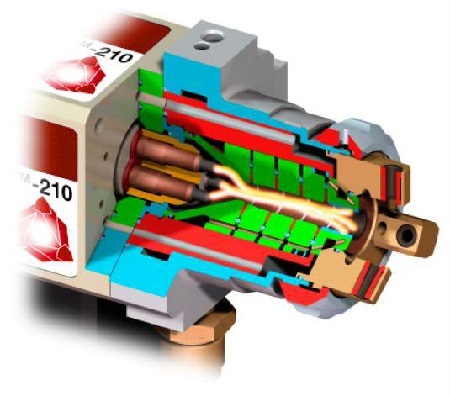 PWL Readers were already informed, in several occasions (#77, 106, 116, 128, 144), of advances in additive manufacturing, performed with laser or electron beam fusion. Now the Welding Journal in the April 2016 issue, publishes an article at page 42 on recent advancements in application of arc welding for additive manufacturing. 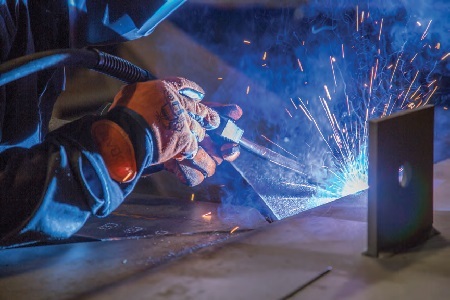 The article, written by an application engineer working with EWI Columbus, Ohio, (EWI.org), explains and describes several initiatives designed to develop new ways of manufacturing metallic items using arc welding. The author reminds readers that the benefits of using Additive Manufacturing can result in near-net-shaped components that reduce material cost, energy usage, and labor. EWI first produced titanium parts, like a control-arm demonstration article (for Lockheed Martin) for aerospace use, by means of hot-wire gas tungsten arc welding (GTAW-HW) out of chamber, and demonstrated acceptable integrity. Then it went on to investigate robotic, pulsed gas metal arc Welding (GMAW-P) and combine CAD-to-part capability. Stainless steel filler metal (0.045-in. 308L) was used for this phase of the project to demonstrate proof of concept on a large-scale component that incorporates shapes and surfaces that are representative of an aerospace part. And the above process was selected to build this part because it is easily automated and capable of relatively high deposition rates. Bead on plate was performed first to select among a few shielding gas mixtures: the conclusion was that 98% Ar/2% CO2 produced the most consistent weld pool with the least discoloration. Then blocks were produced to test tensile properties along three axes: the data suggest that results exceeded 308L stainless steel ultimate and yield tensile strength properties in the X- and Y-axis, but not in the Z-axis. Additional parameter and bead-stacking development is required to reach an understanding of the relationship between these variables and the resultant mechanical properties. Available CAD/CAM software made clear that further improvement efforts must be invested to adapt it to the specific arc welding process. Nevertheless EWI collected data on the influence of different variables, so that the aims of further development are now well defined. 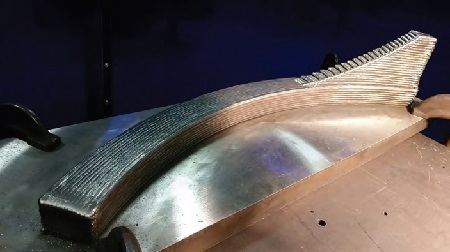 The demonstration resulted in an Additive Manufacturing part that produced an 85% reduction in material when compared with traditional chip machining methods from a block, and showed that the additive process required only 15 hours of arc time, compared to 40-50 hours to machine a final part. Additional software development is required to accommodate the specific needs of arc welding processes, but the benefits for the industries adopting this solution include higher production rates and a large build envelope. Interested readers are advised to seek the original article pointed at above. 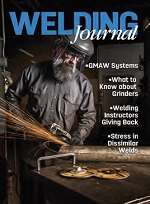 In the April 2016 issue of the Welding Journal two articles deal with using power grinders as accessory hand tools when performing welding jobs. The first article, titled Grinder Selection Tips, at page 58, explains important facts for the correct selection of Right-Angle Grinders. Size, power, weight, cost and efficiency are among the items discussed. The article explains that in grinding wheel language, a higher productivity grinding wheel is one that can remove metal the fastest, as measured by weight removed per unit time. It also shows a case study for a customer who had a bottleneck limiting productivity: by trying larger diameter wheels the bottleneck was removed and cost was minimized. The other article at page 66 offers tips for improving grinding performance in terms of productivity, quality and efficiency. It reminds that choosing a grinding wheel with a softer bond on harder steel will allow for an aggressive cut with minimal chance of glazing. And also that adjusting the amount of pressure applied or the angle of the grind will achieve dramatically different results in grind rate and life of a product. General categories of grinding wheels centered on performance are further characterized by combinations of abrasive material, size, fiberglass and bonding agents. Special products with ceramic and zirconia alumina, although higher priced, will provide longer overall life and material removal, a good choice for armored steel, structural steel, cast iron, and Inconel®. If both cutting and grinding are required, combination wheels are preferred, but one should deepen the understanding, by learning how many layers of fiberglass are there in the wheel and where they are located. Labels indicating use for cutting and light grinding may refer to wheels having only two layers of fiberglass, which is not adequate reinforcement for many grinding applications. Doing some homework and testing is recommended, before making a big purchase order. Match the size with rev/min rating by following manufacturers' instructions. By recording the results obtained with given jobs one is better prepared to improve productivity and efficiency. Interested readers are urged to seek the two original articles pointed at above. 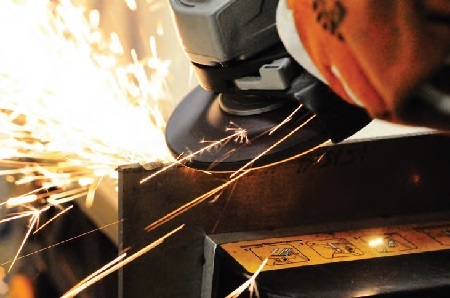 Grinding is an integral part of many welding and fabrication applications. to the work surface for the best performance. Pressure and how it’s applied is also important. Productivity gains can translate in important savings whenever the size of applications is very large. The story reported at page 32 of the April 2016 issue of the Welding Journal, should probably be studied by large structural steel fabricators engaging in steel construction because of the exceptional savings that the switch enabled. It all started when a distributor of filler wire talked with the shop manager of a large structural steel fabricator on the benefits of switching from flux cored to metal cored wire. The potential savings in production costs were to be found in less cleanup operations, better deposition rates, and less smoke, even if the substitute filler costs slightly more than the previous one. An assessment program was initiated to analyze cost and efficiency of welding operations. A significant length of welds was sampled and a time study was conducted with the new metal core wire. The shop became environmentally more friendly because of less noise from slag removal and less smoke generated. It was found that the new filler had a 20 to 25% better deposition rate and required less cleanup because there was no spatter to remove, and no slag meant the disposal of air powered chipping hammers. The contents of the core consist in metallic powders, alloys, and arc stabilizers that provide lower oxidation, higher impact strengths, and reduced silicon deposits. The makeup may vary, depending on the characteristics sought. Some welding parameters had to be adjusted. For flat and horizontal welding the spray transfer mode was satisfactory. For out of position, a pulsed welding process had to be used. The exact type of filler wire was selected by the satisfactory properties obtained, but also because the welders found it easier to use. The shielding gas was changed from straight carbon dioxide to a mixture including also argon: the delivery system had to be changed. Nevertheless, even after the changes introduced, substantial savings were documented, as the productivity increased. Interested readers considering to implement similar changes would do well to study the original article pointed at above. Metal cored wire works well for flat and horizontal welding applications. Lasers ensure particulate-free joining of plastic parts. Overaging (heat treatment) is performed by exceeding on purpose optimal time and temperature, to obtain a condition better suited to special requirements (i.e. corrosion resistance), even at the expense of degrading somewhat the mechanical properties. Pulse in resistance welding is a current of controlled duration of either polarity through the welding circuit. Root opening is the separation at the joint root between the workpiece elements. Transverse weld test specimen has its major axis perpendicular to the weld axis. Underbead crack is located in the heat affected zone in steel weldments, from the occurrence of a crack susceptible microstructure, residual or applied stress and the prsence of hydrogen. Vertical welding position has the weld axis approximately vertical, and the weld face is in an approximately vertical plane. For anyone involved with laboratories performing material testing for mechanical properties, it is important to remain updated in availability of new equipment even if the immediate work situation is not conducive to immediate system renewal. 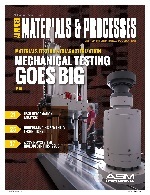 The article published at page 16 of the April 2016 issue of Advanced Materials and Processes (AM&P), an ASM International publication, provides a wide overview of contemporary testing equipment available for most different laboratory requirements. While the equipment described illustrates a line of instruments of a specific company, the typical remarks are probably applicable to all equivalent products. The article reviews first electromechanical testing systems, explaining main structural types and functional details of operation. Modern design enhances reliability, ensuring maintenance-free operation with digital control. The systems described, available for different ranges of load and of specimen sizes, are intended for classic tensile, compression, flexure or bending tests. Then servohydraulic systems are described, usable in static, dynamic or fatigue material testing applications. Make up and functioning are summarized in the article, with the explanation that the more complex infrastructure needed may nevertheless be cost-effective static testing choice at very high forces or if high speed is required. Typically these systems are used for fatigue testing of components, although they may be used for material characterization. Extensometers are briefly reviewed, with attention to high precision strain measurements. Then a short introduction to cyclic testing follows, commonly addressed as low cycle or high cycle fatigue. Examples are given, including composite stressing involving low cycle fatigue testing, with superposition of high frequency oscillation. Strain control (through extensometers) is usually applied, although load control (through load cells) is available if needed. A short review of fatigue testing is introduced, with indication of the data to be collected and reported in suitable graphs. Analysis of fatigue data is briefly addressed, with reference to the Goodman relation, an equation used to quantify the interaction of mean and alternating stresses on the fatigue life of a material. A Goodman diagram is a graph of mean stress versus alternating stress, demonstrating when the material fails at a given number of cycles. A different kind of systems for high cycle fatigue testing is based on magnetic resonance testing. These machines are called high frequency pulsators or Vibrophores. The main advantage of these systems is their capability to perform fatigue tests in a short time, typically 20-40% of the time, and with a power consumption of about 2% of those needed in a servohydraulic machine. The new types use an electric drive for controlled static loading and a magnetic resonance drive for controlled dynamic loading. In short new equipment can be selected to perform accurate testing of mechanical material properties using reliable instrumentation servo controlled with feedback loops, to satisfy the strictest requirements of demanding standards. Interested readers can enjoy reading all the details by seeking the original article pointed at above. that remain in contact with the test specimen up through breakage. 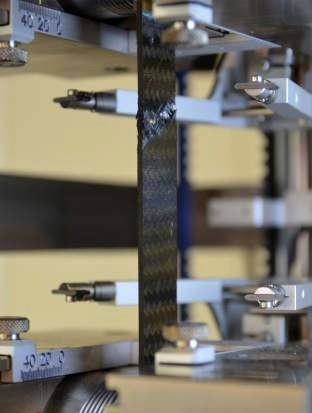 Pictured here is a carbon fiber composite specimen undergoing brittle failure. The Page of this Month introduces more pages on Resources on Metals, Part 2 aimed to enrich your Materials Encyclopedia online. Also this page is dedicated to Steel and its Heat Treatments. We would like to stress the importance of collecting and organizing authoritative professional pages likely to be of real help when needed. It all depends on how well and thoroughly are the different folders built and organized. You may find that an alphabetical index of the terms you would use for searching for the pages would be helpful. All the time spent for building organized knowledge will be returned to you as time saving while retrieving quickly what you may need. It is believed that even pages originating from commercial enterprises, which may wish to promote their business, contain useful information likely to enlarge understanding and provide alternative explanations to complex issues. Click on Bulletin 118 to download all the pages introduced in Resources on Metals, Part 2 and organize them in easily retrievable chapters. 9.1 - Active Metal is one ready to corrode or being corroded. 9.2 - Band Mark is an indentation in carbon steel or strip caused by external pressure on the packaging band around cut lengths or coils; it may occur in handling, transit, or storage. 9.3 - Carbonization is the high-temperature conversion of an organic substance into elemental carbon. 9.4 - Disordered Structure is that of a solid solution in which the atoms of different elements are randomly distributed relative to the available lattice sites. 9.5 - Electrode Potential is that of an electrode in electrolysis as measured against a reference electrode. The electrode potential does not include any resistance losses in potential in either the solution or external circuit. It represents the reversible work to move a unit charge from the electrode surface through the solution to the reference electrode. (1) In forgings, a structure revealed as laminations, not necessarily detrimental, on an etched section or as a ropy appearance on a fracture. It is not to be confused with silky or ductile fracture of a clean metal. (2) In wrought iron, a structure consisting of slag fibers embedded in ferrite. (3) In rolled steel plate stock, a uniform, fine-grained structure on a fractured surface, free of laminations or shale-type discontinuities. 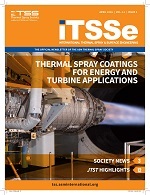 An article published in the April 2016 issue of International Thermal Spray & Surface Engineering (iTSSe), the official newsletter of the ASM Thermal Spray Society, introduces a technological innovation reducing to one third the time required to process a large part of a military aircraft turbine engine. The newsletter is appended as an insert into the April 2016 issue of Advanced Materials and Processes (AM&P) a publication of ASM International. The Thermal Barrier Coating (TBC) described is a heat-insulating ceramic coating such as a yttrium-stabilized zirconium oxide applied over an oxidation-resistant metallic bond coat, usually an MCrAlY. The part involved is the afterburner of the F100 (Pratt & Whitney) engine that powers F-15 and F-16 military aircraft, and the coating ensures its service life and mission readiness. According to the article, the conventional plasma spray operation takes about 4.5 hours to apply the required coating, and the spray gun must be maintained after 15 hour of spray time, equivalent to three parts treated. The new plasma gun introduced, which uses the cascading arc technology, is said to perform the operation described above in only 1 hour and a half. Maintenance on the same gun is required only after 150 to 200 hours. The time benefits speak for themselves, and additionally consistency and reliability are said to be improved. Interested reeders are urged to seek the original article. The above April 2016 issue is apparently not yet available online, but it should soon show up. Look for April 2016 (pdf). Download it as soon as available. Really enjoyed your two paragraphs on incompetence and ignorance. Very well said. A longtime friend and colleague, Anthony Rangus, with remarkable experience in welding and inspection, wrote me these lines. "One thing I have seen over the last 35 years I have worked for Bechtel is the steady upward creep in size of purchase orders for fabricated/welded equipment. Some are over 1000 pages with many specifications, data sheets, technical notes etc. attached, where there may reside in any of them welding & NDE requirements. Anyone else out there seeing this, especially those who review fabricators welding, NDE, PWHT etc. procedures for contract & code compliance?" Readers who feel they can contribute their point of view on the issue are warmly invited to send their note to us by filling the Contact Us Form. Thank you. 14.2 - 18th International Symposium on Zirconium in the Nuclear Industry. May 15–19. Westin Hilton Head Island Resort and Spa in Hilton Head, S.C.
14.3 - QNDE (Review of Progress in Quantitative Nondestructive Evaluation). July 16–22. Georgia Tech Hotel and Conference Center, Atlanta, Ga.